Beginning a few weeks ago, I've changes my technique for shooting star trails in order to bring out the colors of the stars a bit more. Instead of shooting at a lower wide-up aperture and high ISO, I've begun user a slightly smaller aperture, lower ISO, and longer exposure times. 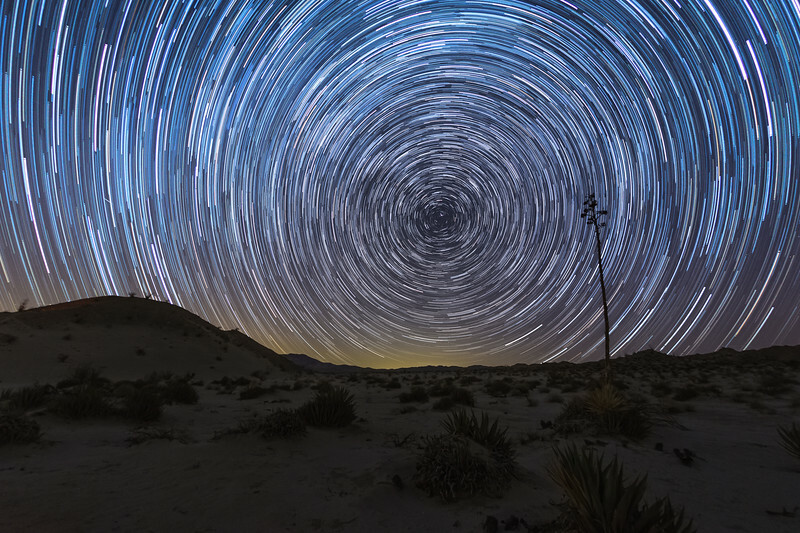 To produce this image I combined 104 exposures - each shot at 40 second f/4.0 ISO 1250 using my Canon 6D and Sigma 15 mm. I then spent almost two hours removing airplane trails. If you look closely you'll see a small meteor about midway up and to the left. I stacked the images using StarStax. A century plant / yucca to the right. Shot near the Hollywood and Vine area of Vallecito Creek Road in Anza-Borrego Desert State Park.